The National Association of Community Health Centers (NACHC) serves as the leading national advocacy organization in support of community-based health centers and the expansion of health care access for the medically underserved and uninsured. As such, data analysis and visualization is an important part of ensuring health care is delivered where it’s needed most. NACHC contracted with UPGIS to analyze community health center data and map the locations of over 10,000 community health centers throughout the United States and its territories. Geocoding and Data Analysis. Data for community health center delivery sites was given to UPGIS in non-spatial format and were then plotted in ArcGIS. 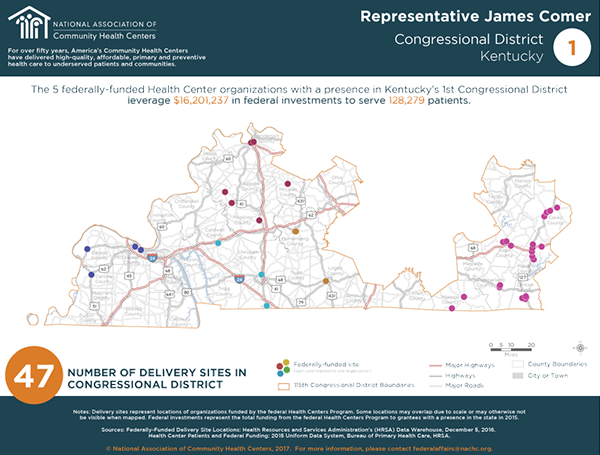 For the analysis, UPGIS utilized tools within ArcGIS to determine the number of community health delivery sites within each state and congressional district.